Sometime last year I was shopping in my favorite local home decor spot. It’s only open on Thursday and Saturday so it’s a treat to remember to stop by and browse. Not only is it crazy affordable, everything is classy and beautiful and fun! 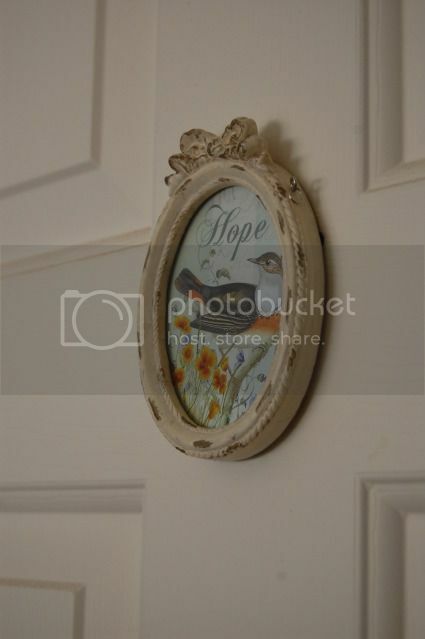 While there, I stumbled upon some adorable oval plaques with birds on them. Each had one word. As I looked through the stack, the thought occurred to me, these would be perfect for the doors of the upstairs bedrooms. At the time we renovated this house we were pursuing adoption. We have six bedrooms (one is my craft room) and had planned to fill them with children. Those plans were not His plans. We found ourselves with rooms that needed a different purpose. We would use them to be hospitable to friends and family. In the style of some of our favorite B&Bs, we would name each room. I read the signs and there, we found the names. Ray helped choose the name of each room. The room that feels like staying at Grandma’s is called “Grace”. We have names like “Dream” and “Believe” (my craft room) and the Master bedroom is called “Joy”. I’m looking forward to seeing what the Lord creates here, in my own little corner of the world.